My second quilt entry (see the first here) into this spring's Blogger's Quilt Festival is "Soar," my third orange peel quilt, in the Small Quilts category. 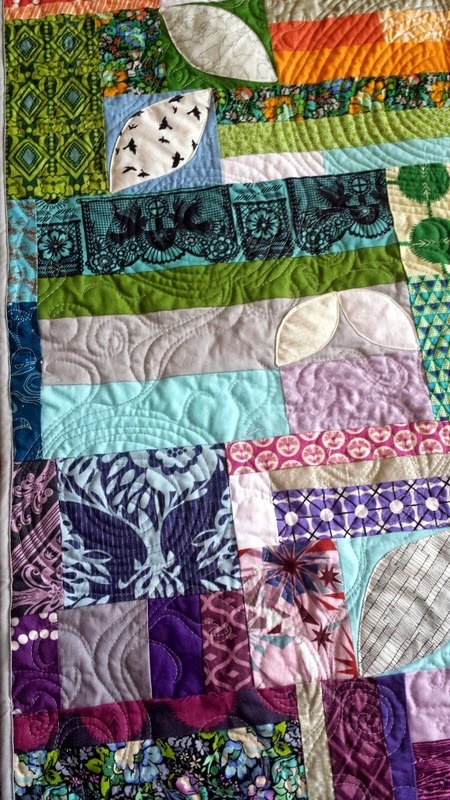 As the color inverse of "Scatter," this quilt serves as another example of how you can mix planned improvisation and machine (or hand) applique. The colors make me infinitely happy! I built "Soar" from the bottom up (and can you tell what my favorite color is?). To achieve the color gradation, I set a few strips here and there that were parts of colors surrounding the one I was working on. I share more detailed tips on piecing a "planned improvisational" background in my Orange Peels and Improv classes. The finished size is 41" x 57". Orange peels have become a fascination of mine and a great pleasure to indulge in. I have so many more plans for modern traditional quilts with them. Making peels is a process that, while laborious at times, is also thoroughly relaxing. The work really comes into play with the improvised background. In this quilt, I played with the scale/size of peels and placed them all on solid backgrounds so that they would pop against the scrappiness I'd planned. You can see more about the process and many more pictures here. For the quilting, I felt that all of the rectangles and squares needed to be contrasted with curves. The spirals are supposed to evoke the wind carrying the petals away from the only "whole" orange peel at the bottom left (yes, there's a ghost peel there!). Lots of Anna Maria Horner goodness on the back. This quilt is for keeps! Thanks for visiting and I hope you enjoy the Festival! I love the back on this one! I got some in the white colorway...it is perfect for a quilt back. And other effusive comments about this quilt. I can't brain today, I have the dumb. Oh ya... That's a keeper! It's so pretty! I keep going back and looking at all your yummy purple fabrics to help me pick out great purple prints when I see them (for some reason pink and purple are hard for me to buy). Purposefully planning to put the orange peels on solids is awesome and I really like your thoughts behind the quilting, too. I've always loved this quilt - especially the bright colors. Good luck! The quilt makes me smile every time I see it! It's beautiful! What a pretty quilt! 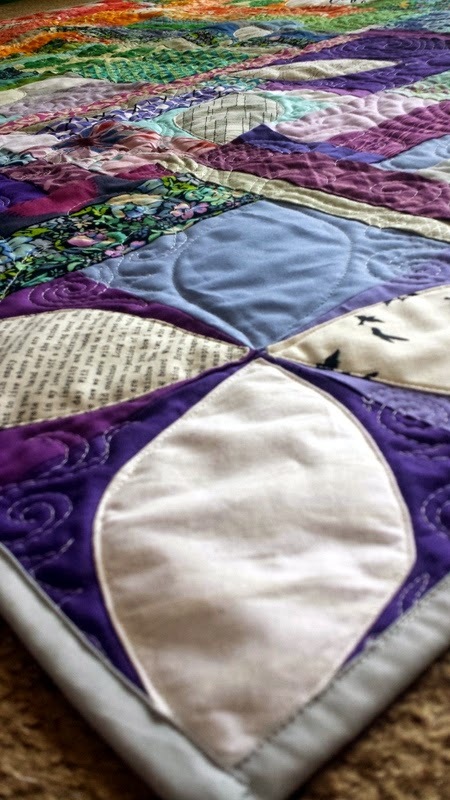 The colors are wonderful, and your way of improvisational piecing makes it so intriguing. I really like what you've done, and I wish you the best in the Blogger's Quilt Festival. This one's a winner! This is beautiful! I love the look of orange peels but am totally intimidated by appliqué. This inspires me to give them a try! I love your orange peels, But I think this one is my favorite. And the BACK! gorgeous. This is fantastic!!! I love this!! !